Santa Monica’s Ocean Park neighborhood is situated right on some of the most desirable Pacific coastline in Southern California. The neighborhood, flanked by the beach and the PCH, just south of I-10, features gorgeous waterfront views, salty ocean breezes, beachside condos and Ocean Park Santa Monica apartments, and an upscale beach vibe that attracts hundreds of residents and visitors alike. Often compared to neighboring Venice Beach, Ocean Park is often considered just as creative but more affluent, with home prices soaring up to the multi-millions. Residents love living so close to the waterfront - truly an unforgettable sight - but also enjoy all the shopping and dining options along Ocean Park’s Main Street near Ocean Park Santa Monica apartments. Start with brunch and locally brewed coffee at Thyme Cafe & Market, or head over to budget-friendly O.P. Cafe for some local, seasonal cuisine. Local artisans and artists make their living selling goods in Ocean Park’s popular boutiques, and after a day of shopping, you can head over to 18-acre Clover Park to relax and soak in the California sunshine. Don’t miss the weekly neighborhood farmers market, a chance to pick up the freshest produce and baked treats around, the perfect destination before a day of gallery-hopping or wave-riding. No matter where you go in Santa Monica and beyond, it’s sure to be an adventure you won’t forget. Thankfully, the area is perfectly situated near major highways and offers plenty of transit options to get around quickly. Hop on the PCH, head up to the 10, drive east to the 405, or take any of the local bus routes from Ocean Park Santa Monica apartments and along the coast, and you’ll have no trouble getting where you need to go in a flash. 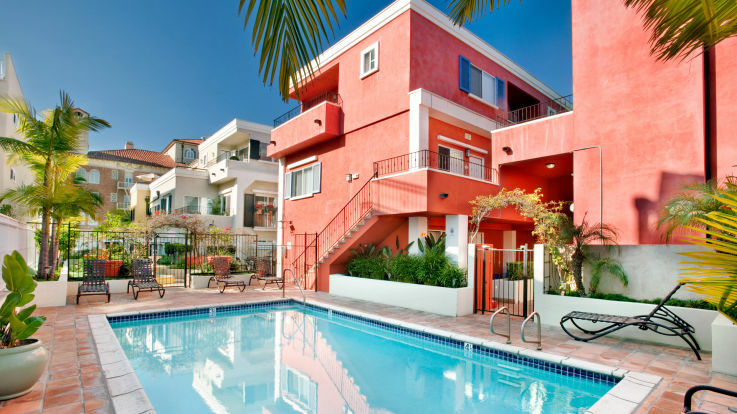 For small-town vibes, a hip, beachy atmosphere, friendly locals, convenient Ocean Park Santa Monica apartments and Pacific views you can’t get anywhere else, settle down in Ocean Park and see everything the tight-knit coastal community has in store.